Three generations together. Seriously, I wonder what that little girl is thinking while watching those shows. What is being processed? Is she admiring beauty and design? Or is she being imprinted with an insane concept of female body image? Or is she thinking about going home to watch Dora? From the light and spectacular expressions, I’m guessing the Mother Ship has landed on the Thakoon runway! Adorable, and her little doll too. OMGoodness, off topic, but I have a picture of myself as a teenager wearing the exact same outfit as the little girl’s doll! Love the expression on the little girl’s face! Interesting. Not sure I would bring a child to a fashion show, and I have two of my own. The images of beauty that walk the runway are just not realistic. Aww her American Girl Doll. brought me back to my childhood. That is how I am starting to feel too…so happy to be there but I am ready for a fashion nap :) Just a quick one! that is one lucky little girl! love the expression on her face. now that is a kodak moment. never been so jealous of an 8 yr old girl b4! so lucky! Group pictures are definitely Scott’s strong suit. That made me laugh. So envious of this girl! So little and watching fashion show! I love the collection, but am I the only one who thinks she yawning? I don’t think any of the dresses that showed would have flattered her American Girl Doll anyways. What an amazing photo! I’m also would love to know what see is thinking! How she sees the shows and also the world! What a great mom to bring her daughter with her! Cute ! But I wonder wether she is bored or impressed ? Kids at fashion shows are annoying, a logistic nightmare and make them a useless event: they are proof that a fashion show has lost its real professional sense and turned into something… else. Not loving this at all. Love the american girl doll. This is an astonishingly great photograph! It could take its place in MoMA. Exactly my reaction if I were present! Great shot! Wonderful moment captured!! I like the glasses on the little girl. So small to be so chic! It’s your modern version of a John Singer Sargent portrait–or a Renaissance madonna. The mother is so beautiful and calm and deeply content. Mother and child–and your image, so beautifully composed and dynamic is an eternal portrait. Bravo for finding the classical and timeless in todays hurly-burly of fashion. Pretty sure that the girl is yawning. Good capture though. I think its so right on with the little girl being there, she could be someone to watch yrs from now,,,and for the people who said she shouldnt be there (because someone did say that), you wish it could have been you years ago…..
Oh the fashion of the face! Exceptional. Wow cette photo me fait froid dans le dos, elle est belle et en même tamps ce “tel mère tel fille tel poupée”… donne matière à réflexion! 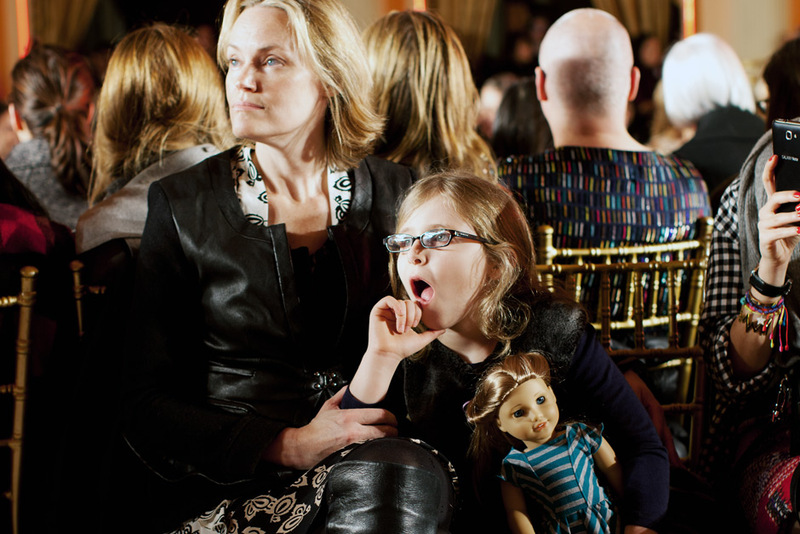 Funny, but I thought this stunning photo, beyond first glance, might say a lot more about mom than the young girl with her doll and made me wonder, as I think the lens might have wondered, if the pose was just a little too perfect. This is such a beautiful moment captured!